or Can You See What I See? As much as we hate to think of this, every cell in our bodies is continuously aging. While there are many cells that I would not mind see die a natural death, especially those extra ones around my middle section, I'd rather not think that my eyes are in that group! 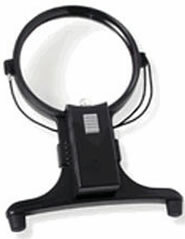 As one website says: Magnifiers are only one piece of the solution to vision impairment and must be chosen carefully. a broad range of products and prices for that little bit of extra help that eases our work or play. 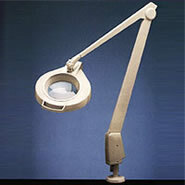 lighting (written about in Gadgets & Gizmos 2005), maintain good posture for each task and preventing eye strain. Most of our bear work involves fine detailing: try hand-stitching 20 stitches per inch on dark colored bear fabric, without good lighting and/or magnification! Vision aids are in 2 basic categories: adaptive and optical. Optical aids magnify the objects being looked at. Ambient lighting or additional illumination increases viewing ease. Adaptive aids modify objects or one's environment making it easier to see. 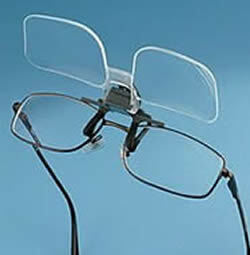 Magnifiers aid those that wear prescription glasses as well as those that do not and are available from 1.5x - 5x magnification. or use a free-standing floor model. I'll not address the hand held styles as we need both hands to work and it's cumbersome to keep picking up and setting down a magnifier. That would also not show you what's happening while you're actually doing the work. Purpose, price range and ease-of-use are usually the deciding factors. Prices also vary based on factors such as the material and strength of the lens and the type, if any, of illumination (battery, bulb, or light- emitting diode). area immediately in front the end of your finger or the tool. Use your 'good eye'. Focus with or place the magnifier where it's most easily used by your stronger eye. Make a sling. With elastic bands (rehab & sporting goods stores) knot off length of stretch elastic band that goes around your shoulders and supports your forearms in the preferred working position in front of you. This especially helps if you are reading or sewing in one position for an extended length of time. Occasionally change your point-of-focus. Every 10 minutes or so look off into the distance and focus on objects as far away as you can. Move your head as far as is comfortable from the left to the right. Move your whole body. To avoid Repetitive Stress Syndrome in all parts, stand up and move around, jiggling & shaking everything that jiggles and shakes. It may feel and look silly but it's a great stress and tension reliever. Probably the least expensive option. Not really used for continuous looking through, as your eyes might tire seeing the focal length change as your hand or tool move, but they're excellent for occasionally looking through to thread needles or pluck away the finest wisp of mohair. These include clip-on, flip up lenses, for one or both eyes, headband styles like the long-available OptiVisor® that allow you to wear your own prescription glasses underneath and the styles that sit midway against your chest between your eyes and your work. All of these are available in differing strengths or magnification and are moderately priced. Bobbie's complete reference page with addresses and web links.